By the time you read this, you would already have known both Preston Yuen and I are at the Consumer Electronics Show in Las Vegas, reporting from the show floor. This is the first time APH Networks has ever gone to CES. When I realized we were able to apply and attend this conference back in July of 2015, I was excited and ready to go. Since then, we had done a lot of small tasks such as booking flights, accommodations, and finally, scheduling meetings and appointments with many different companies and manufacturers. There has been many "first-time experiences" while planning this trip, as this is also the first time I have traveled without my parents. Professionally speaking though, I can say I never expected I would ever get to go to a show like this, and I cannot say enough how excited I am to be here. 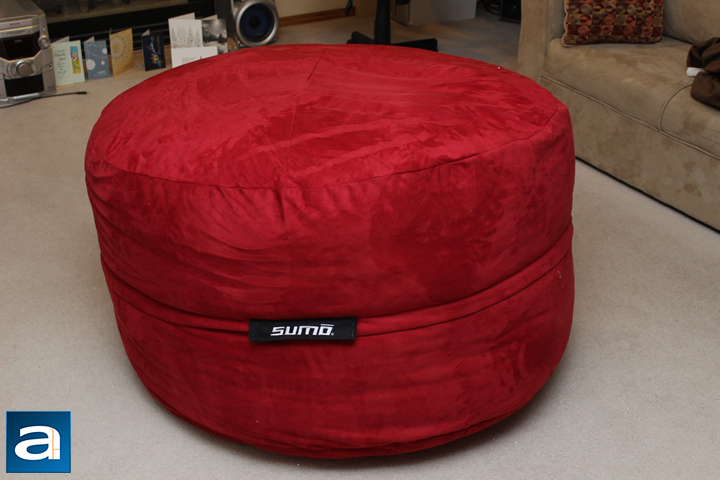 The same could be said for today's lounge article of the Sumo Gamer Suede beanbag chair. Say what you will, but I again can say I never expected to review a product like this. Even when I told my friends I would be taking a look at a chair, they all asked me if APH Networks suddenly turned into a furniture review site. While it probably would take a different mindset when reviewing furniture, I can say it would be pretty cool. I mean, reviewing beds would be something I would have to sleep on, haha. Anyway, as Sumo has sent us several beanbags in the past, like the Omni and the SumoSac, it is now time to take a look at today's offering, the Gamer Suede. Will it still be the same puffy goodness we have seen from them in the past? And what makes this beanbag for gamers? These questions and more will be answered in today's article! Today's parcel arrived from a small suburb in Vaughan, Ontario, Canada. 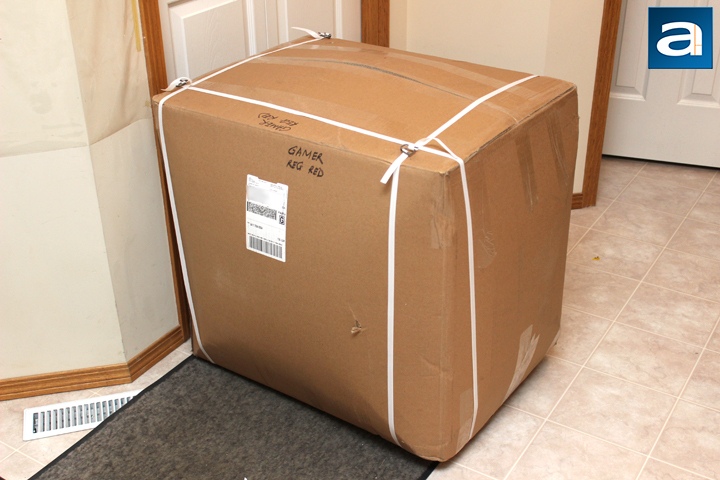 This huge box arrived via FedEx by their Ground services. As you can see, the box is almost bursting from the seams, as the sides are bulging out quite a bit. Sumo has made sure this beanbag stays in the box, as it also has three packing straps wrapped around the box to ensure it does not fly open. There were a few scratches and dents on the cardboard, but no puncture holes or anything of the sort. Considering its contents are practically what is used to protect other shipments in transit, I would not be too worried about transporting it in the first place. I quickly went to work, cut open the white straps, and opened up the box to peer what was within. Inside the box are two clear plastic bags, holding two separate things. One is the red suede cover, and the other is the huge black beanbag. Both of these bags are sealed in the clear bags, and vacuum packed to make it easier to ship the entire package. 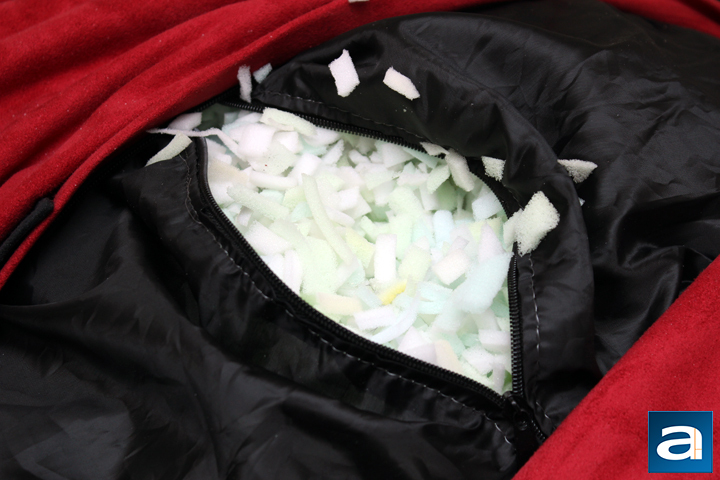 Upon opening up the bags, air was drawn into the beanbag, and it quickly grew in size. I have to say this is one unique way to pack a beanbag, but it also surprised me at how humongous the chair grew into. It is already large out of the box, but the final shape is just crazy large. Thankfully, out of the box, there are only two things to actually put together, which is to put the red suede sleeve over the black beanbag. - The Gamer Video Game Chair Measures 48" X 48" X 30"
Putting the sleeve over the black bag on the Sumo Gamer Suede is probably easier said than done, because there were some struggling moments. For one, because of the sheer size of the beanbag and the sheer lack of length in my arms, I had to work slowly to get the red sleeve wrapped around the beanbag. In addition, since the beanbag was still expanding after being vacuum packed, the black bag was still expanding in size. After two attempts, I finally wrapped it up, and the result is as you see above. 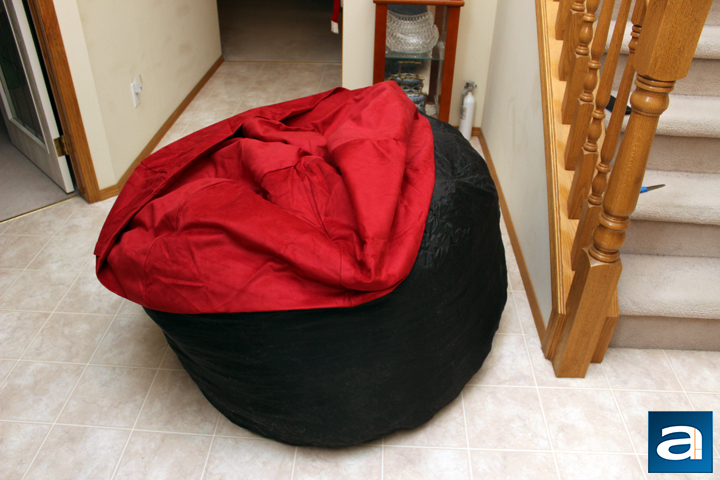 At a huge size of 48" in diameter and 30" in height, this beanbag is not for a small apartment or condominium. In fact, even my parents slightly freaked out when they realized how large this blob was. Thus you probably want to have a large open area to put this thing. I will say it is nice the way Sumo has implemented it with two separate bags. If you, or anyone else, had some sort of accident, such as spilling liquids onto the beanbag, you can easily remove the sleeve, throw it into the washer and voila, it is brand new! Since the black bag itself is somewhat water resistant, the foam should not get too wet either. As well, if it gets dirty after enough use, you can again wash the outer layer easily. Other beanbags generally have the foam-like beads inside, and thus exhibit two issues. First, they do not conform to a person's body, but rather spreads out to the point where only a thin layer of cushioning remains between you and the floor. Secondly, when the person gets off the chair, the beans stay in place, and are only reset when the user picks up the beanbag and all the beans fall to one side. Unzipping the black filling bag proves this actually is not a "bean" bag chair per se, but rather filled with polyurethane foam. This shredded up foam seems quite interesting, but this is the main reason why Sumo guarantees the chair will never go flat, and can return to its original form. I should say it is essential you let these expand after opening the bag to maximize the comfort, as it loosens up and fills up more space. Compared to the previous Sumo Lounge Sumosac, the green tinted foam definitely looks better, as it looks less likely to be recycled material. As for using the beanbag, it definitely is an interesting experience. You can fit two to three people on it, depending on the size of the person. This is also actually quite comfortable for general gaming or TV watching. As promised, the Sumo Gamer Suede molds to your body shape, creating a natural indent. Once you get off, it also returns to its rounded nature. It is generally quite comfortable due to this nature. I really like the red color this beanbag comes in, and there are definitely other colors if you so desire. However, one thing I will mention is the fact the suede material easily collects static electricity. This is accentuated even more so with the dry climate Calgary has. It is not too bad, but it can get annoying when you try to clean dust or other specks off the beanbag, because they easily stick. In addition, the internal foam quickly gets out of the black bag and onto the red suede cover due to the static attraction. I will say, everything feels high quality. I do have to wonder where the "gamer" aspect of the Sumo Gamer Suede comes in. I mean, for console gamers, beanbags make sense, as it is a lighter alternative to a couch, and it can be rearranged to create the perfect distance to the television. However, there is nothing really gamer-specific separating the Gamer Suede from any other Sumo beanbags, other than the sizing. There is nothing wrong with this, but it would be cool to either see Sumo team up with game publishers to produce specially designed sleeves, or to include some features like armrests or bottle holders for drinks like Mountain Dew. This being said, the Sumo Gamer Suede beanbag chair is an excellent addition for your man or lady cave, provided you have sufficient space. Sumo provided this product to APH Networks for the purpose of evaluation. 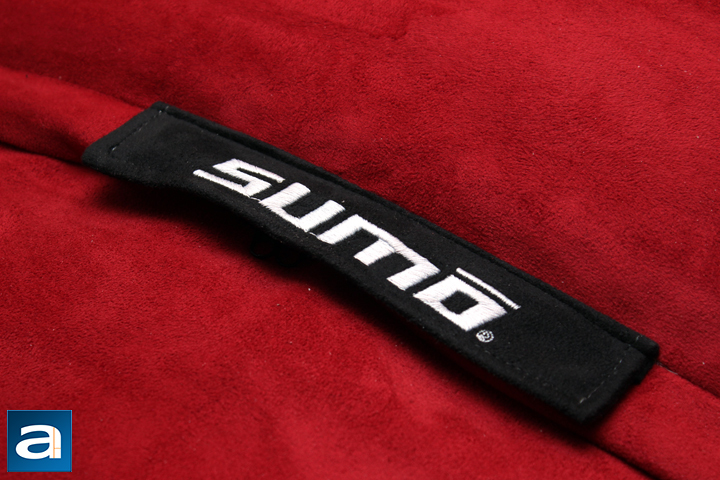 Do you have any comments or questions about the Sumo Gamer Suede? Drop by our Forums. Registration is free, and it only takes a minute!